A friend of mine posted a link on Facebook to an article entitled This is what would happen if college tuition became free in America. The main thrust of the article is that because “free” tuition actually increased debt and decreased participation for lower-income students in some other countries that have tried it, the same thing is likely to happen in the U.S. As such, Bernie Sanders’ goal to make college tuition and debt free for low-income Americans would be misguided and unlikely to work. I agree with the article that the danger is real, but both the article and Sanders’ plan leave out some important contextual information. The short, easy answer is: to get a job. Ask anyone–current students, their parents, employers, politicians, high school guidance counselors–and this answer will certainly be at the top of the list. However, if you ask college graduates the question, “What percentage of the stuff you learned in college do you actually use on your job?” then the answer is going to be, “Almost none.” It begs the question, if going to college is so damn important, why don’t employers make more use of the skills people learn there? In fact, most of what people use on the job is taught to them once they get there, either formally or informally. Some people try to make the argument that it is for the more abstract, “soft” skills that people acquire in college–things like teamwork, communication skills, and critical thinking. However, if you believe the people who produce the Collegiate Learning Assessment and the people that write about it, college is actually not very effective at imparting these skills. Furthermore, for many professions, if you really want the knowledge, you can probably learn all of the stuff on your own for free (or close to it) just by using the web. MIT, for example, puts all of their course syllabi online so you could just look up to see what the course materials are and follow them on your own. Then there are things like MOOCs and places like Udemy, Coursera, and Lynda.com. Ironically, even having acquired these skills on your own, which arguably demonstrates you have the initiative, resourcefulness, tenacity, and critical thinking ability to be a great employee, without that piece of paper, i.e. the diploma, most companies won’t even look at your application. A college diploma is a convenient way for employers save time and money, i.e. to allow HR departments to filter out a huge number of potential job applicants without actually looking at their applications. This is the only explanation that makes coherent sense. We have been duped into providing a huge benefit to companies and shouldering the expense on our own, and in a way that makes us indebted to the economic system at the beginning of our lives. This will not stop until companies stop requiring college degrees as a condition for employment. Trend-setters like Google have already begun to do this. I believe it is only a certain amount of time before other companies follow suit. In this context, Bernie Sanders’ plan to make employers pay for college makes perfect sense. Employers are the primary beneficiary of the current system. It is immoral to strap our young people with so much debt, so early in their lives, with the vague promise of the potential to get a job. 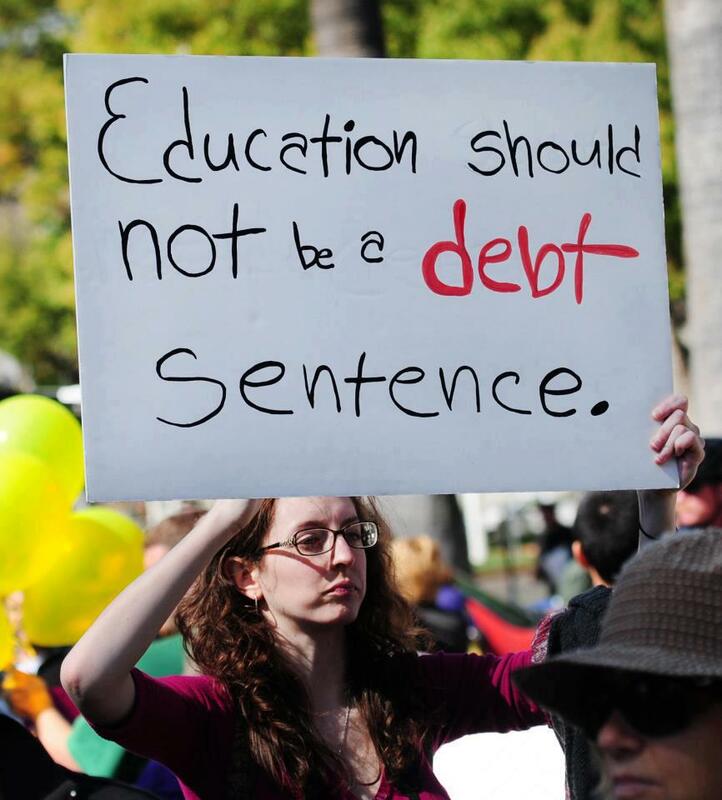 Taxing the wealthy to pay for college is both appropriate and fair. As with so many such plans, however, the devil is in the details of implementation. I agree with Lawrence Lessig, the MAYDAY PAC, and the folks at Represent.Us, that until we can pass legislation to get money out of politics, this issue, along with pretty much every other issue we care about, is doomed to a feeble, lackluster response, if not outright failure. That’s why I urge everyone who cares about anything to support these causes. We won’t fix any problem until we fix this one. For what it’s worth, I think Bernie Sanders is the closest candidate in the current field to understanding this and actually doing something about it. Oddly enough, the other candidate who is least likely to be beholden to special interests is Donald Trump. Yes, he’s a megalomaniacal lunatic, but at least he doesn’t have to pander to anyone. To be clear, I am NOT advocating anyone vote for Trump. So, should people go to college? Maybe. I work as a college professor. 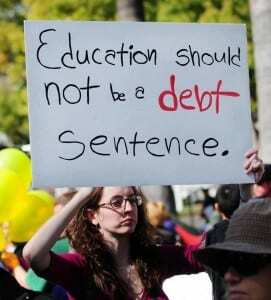 Some might find my cynical view of the current status of a college education hypocritical. However, if anyone has read any of the posts on my other blog, you’ll see that I believe the current system is an impediment to learning, self-awareness, and our chances of solving big problems in the world. The current pragmatics of college are a very real and potent obstacle to learning. I’ll save the details of who I believe should go to college, and why, for another day. In the meantime, I agree that making college available to everyone in a way that won’t leave them in debt is a laudable and worthwhile goal. Just because there have been problems with implementation in other places doesn’t mean we shouldn’t try it here. Don’t be dissuaded by the nay-sayers–they probably work for special interests anyway, even if they don’t know it.